Should I buy an investment property with a pool? The house you’re looking to buy as an investment property is ticking all the boxes on your checklist. You walk out the back door and see….. a pool! You go to your checklist, try to find the word pool with the little square tick box and there isn’t one. Now you’re thinking, “is a pool a good idea to have in your investment property?”. Does a pool make sense for your target market for this property? Is the location of your investment property in a part of Australia where access to local swimming holes are restricted (for eg. In northern Australia where crocs and stingers limit swimming in the ocean and natural water holes)? Is your property in a more prosperous, family-oriented area where a pool will be considered a valuable inclusion? Or alternatively are you potentially decreasing your odds of a tenant picking your property due to the pool maintenance because of cost or because there is a beach around the corner. You need to research your target market and talk to a real estate agent in the area. You will also need to factor in the cost of supplying maintenance equipment for your pool, or if agreed upon with the tenants the total cost of maintaining the pool by a professional pool cleaner? If you increase rent to cover the costs, will this discourage potential renters? Will your rent be seen as too high? 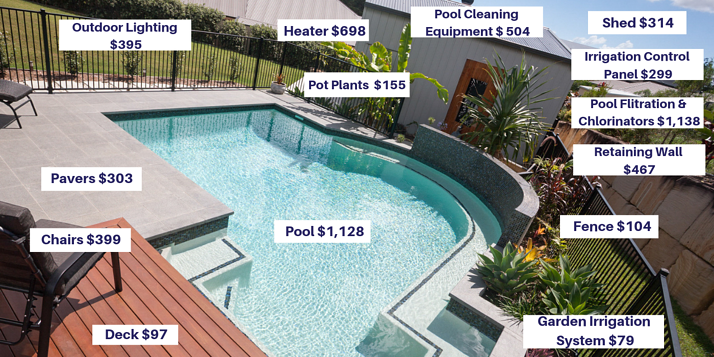 Domain.com.au estimated the annual cost to be $1,400 per annum to maintain only an average eight metre by four metre backyard pool, this is excluding the energy and chemical costs that can easily double that figure brining the annual cost to around $3,000. Click here for the breakdown. Larger pools can cost up to $5,000 per annum. The costs of owning and maintaining a swimming pool largely vary based on the age of the pool and the pool equipment. Newer pools are self-cleaning where older pools will need more hands-on maintenance, like scooping out leaves and debris that may have fallen in. It is recommended that the quality of water be tested daily, for chlorination, pH levels, total alkalinity (TA) and calcium hardness and the filter emptied. This can be time consuming. Typically, your rental property agreement will state that the tenants are responsible for the maintenance of the pool. And the landlord is responsible for supplying and maintaining the equipment to do so. Your property manager can employ someone to do monthly pool maintenance if you are unable to do it. The cost of hiring a Swimart pool cleaner once a month is approx. $120 per visit for an average size pool. Keep in mind that the costs of maintaining the pool will be tax deductible expenses. Additionally, a lesser known fact is that some of the cost of owning a swimming pool in your investment property can be offset by the depreciation deductions claimable. When it comes to depreciation investors often focus on the property’s building structure and assets and forget about the outdoor items such as pool, pool equipment, maintenance shed, retaining walls, pergolas and chairs. Check out below for some of the items that can be claimed in this outdoor oasis – a total first full year depreciation deduction of $6,080! SA - Is Your Swimming Pool Kid Safe? So, as you can see, when considering whether to purchase an investment property with a pool there are a lot of factors to consider in terms of financial and legal responsibility, as well as whether it is suitable for your target market. At the end of the day, you need to determine if owning a pool in your investment helps your overall property strategy? 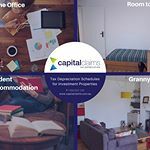 If you would like to know what tax depreciation deductions you are entitled to claim from your investment property with a pool or without, complete our FREE estimate form online here. 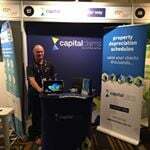 Or you can call Alex our Senior Depreciation Specialist on 1300 922 200. Buying a Granny Flat to rent out? Capital Claims Tax Depreciation © 2017.